The subject of ghosts is vast and something that man has been curious about for millenia. It is a subject that touches every culture on Earth and is addressed in every religion. After all, who wouldn't want a glimpse at what happens after that dreaded event called "death?" I am a huge fan of the subject and there is nothing that intrigues me more and nothing I'd rather do on a Saturday night than read a ghost story or watch a ghost movie. Halloween, as you might imagine, is my favorite holiday. As Halloween approaches, the leaves on the trees change, the weather gets cool and crisp, and out come the sweaters. Apples, hay rides and pumpkins are the theme of the season and at night, there's nothing better than to cuddle up and watch scary movies, eyes glued to the screen, hand in the popcorn bowl. Halloween night is the spookiest and most fun of the year, with kids marching to the door, asking for candy, wearing their favorite costumes. To me, Halloween never lasts long enough. I turned my passion into a business. So when I decided to learn how to build websites, I picked my favorite topic - the one I enjoy most - as my very first project. You know how learning new things can be a challenge? Well doing something you love takes the "work" out of it, so the learning becomes fun and rewarding. And that's how this site has been for me. I started this site in 2006 after I discovered Site Build It! (SBI!) and I've been hooked on the Internet and creating websites ever since. SBI! taught me that I could start a business based on something I had passion for, and ghost stories is something I have passion for. It took a few months to start making an income, but now the monthly income I earn from this site is more than my dad's pension, which took him thirty years to acquire. You get everything you need with SBI! to start learning and building, including the software. You don't even have to know coding. If you can check email and surf the Net, you don't need any more technical knowledge than that to be successful with SBI! SBI! helps you learn everything, even coding if you should be so inclined. It teaches you everything about business site building, including how to research ideas, brainstorm keywords and write pages so your site gets traffic. They teach you how to turn your passion into a viable online business that you can do at your own kitchen table in your spare time. They give you step-by-step instructions on researching your business and growing it, with so much support you never feel alone. Why Would Someone Like You Want to Know About SBI!? Well, unless you've been living on a deserted island, you've probably noticed how dismal the economy is. In my circle of friends a good 30% or more of them are now unemployed, or else their spouse is unemployed. The people who live behind us are losing their house to foreclosure and many others I know are experiencing the same fate. People are losing their life savings and their investments have evaporated. Getting a job can be fruitless for many. SBI! is one solution that really works to earn an income from home and to start your own e business. Many families could use the extra income. Forget about pie-in-the-sky riches. Since jobs are scarce, I'm talking about a reliable way to create your own part time job. Who couldn't use an extra $200, $500, $1,000 or more a month? SBI! Is a Source of Income Right at Your Own Kitchen Table. In any economic climate, finding a way to make extra money is a good thing. But what's even better is having a way to make extra money - that can build into a full time living - where you can work in your pjs right at your kitchen table or in your living room. Heck, I even work in the backyard sometimes, which is wonderful on those days when the weather is absolutely perfect. There are a gazillion places to get webhosting, and yet another gazillion opinions or claims that you can make millions overnight. But SBI! 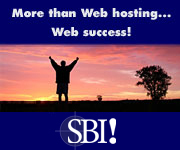 is much more than webhosting. Sure, hosting is included, but it's so much more. It's a self-study e businesses building course with all the tools you need in one package. No confusing, conflicting opinions, no searching high and low and trying everything under the sun to desperately to find something that works, just a step-by-step course that gives you a real education about the Internet and how to create a successful business - online and off. But it's actually more than that even. The support system is amazing. 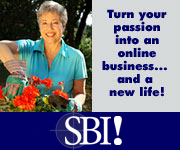 Besides an immense library of free training and world class technical support, the SBI! forums are full of happy, helpful people who are more than willing to help. These are some of the most wonderful, generous people anywhere and I have made friends all over the world as a result. But That's Really Not "It!" What happens with SBI! when you roll up your sleeves, do your study and build your business properly, is your site rises to the top of the search engines. What does this mean to you? Traffic - lots of free traffic to your site, which is the envy of many webmasters across the planet. One of the hardest things to do is to build a site that gets traffic. One of the unique phenomena of SBI! sites is that they tend to dominate their niches. Of all the millions and billions of web sites in the world, it is not uncommon for SBI! sites to consistently rank highly in the search engines. As a matter of fact, there are many, many SBI! 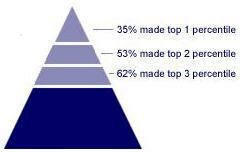 sites that rank in the top 1% of all the websites in the world. Not too shabby for my first site, huh? And traffic is only the tip of the iceberg. After you get traffic, you learn how to turn that traffic into income. Then, because you have a highly trafficked site, with traffic that doesn't quit, your site blossoms into an income-generating business. You can use that online traffic to generate offline business, sell products online or sell other people's products or advertising space. The sky's the limit. But That's Still Not "It!" Because SBI! gives you so much (training, tools, support) you have the opportunity to learn a new and valuable skill - one that stays with you forever. You can use this skill to get a better job, to build sites for others or build more income-generating businesses for yourself. 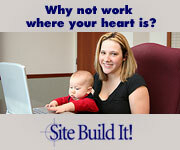 Many people who join Site Build It! quickly realize they can fire their boss and work at home, or at least make it their goal. Once they see for themselves that it works, they realize they have in their hands the means to gain personal and financial freedom. Others use their online businesses to fund their retirement or just have a savings plan that pays for family vacations, their kids' college educations and more. Can Create Their Own Ever-growing Business. It can help your family make ends meet, or it can provide freedom and a better life. If you've thought about going back to school to enhance your skills and bring them up-to-date, you may have thought about taking a web design course or two. If you've researched this, you might be amazed to discover that while many schools offer "design" classes, very few schools offer the curriculum that teaches how to actually get traffic and monetize a website. In fact some people have spent tens of thousands of dollars only to find out they know how to make fancy looking pages, but have no idea how to get traffic to them and make them earn income. However, the Site Build It! course is taught in many learning institutions across the world. That includes universities like Penn State, The Citadel, The University of Arizona, The University of Wisconsin all of whom feature the Site Build It! course as how to create a successful Internet business. Other people than me :o) rave about Site Build It! because of the success they achieve. Here's a letter from a happy customer to Ken Evoy, President. I purchased SBI! close to a year ago. I had heard great things about SBI, specifically from Michael Holland who has a few SBI sites. I took the plunge -- "jumped in with both feet", as you say -- and as you can see, I used the SBI builder to make a beautiful site (www.ArtellaWordsAndArt.com). And I use the Paypal shopping cart with SBI to sell 250+ products and it works great). When I started with my SBI site just short of a year ago, I had one single product. There was no way that I could have built a financially profitable business with my magazine, on its own. But thanks to all the options and resources from SBI, and to lots of out-of-the-box thinking, I found that it is possible to build a business that combines multiple streams of income in e-courses, teleworkshops, eBooks, lectures, an online marketplace, etc. I just wanted to write you a quick note to tell you that you could not have been more right when you said that my life had changed forever when I got SBI...it is so, so true. Thanks for everything! And thanks, too, to Michael Holland for telling me about it! You can be sure that I will pay his favor forward and tell others. "Okay, Thanks Brenda for Reminding Me! I'll Just Go Start a Blog Like Everyone Else"
That's fine, do as you like, but realize 99% of blogs fail. Why? Because it's the wrong model on which to build a business. Read this revealing article to find out more. SBI! businesses succeed because they use a process called C -> T -> P -> M which stands for Content, Traffic, Presell, Monetize. It is this unique process that makes your business grow and become profitable. Use this test to check out your favorite online business and see how they stack up against SBI! sites. So . . . What's The Catch? Frankly, there is no catch. In fact, it's a lot of hard work. You have to be dedicated to your business and like anything else that's worth having in life, you have to work for it. It takes persistence and a bit of drive. SBI! provides the training and the tools, but no one does it for you. But let me tell you, there's nothing more motivating than watching the search engines send you lots and lots of wonderful visitors (like you) day in and day out. And like anything else worth working for, as you watch your passion take shape into a real business, your business becomes your love and your success enriches your life. I will say this: for those who don't want to put in the hard work, this is not for you. Please don't waste your time. But for the rest of you who are tired of being kicked around by the whims of life and the economy, prefer to be self-reliant and could use some help to do something to improve your lot in life, I sincerely urge you to check this out. The Way I See It, You're on the Internet Anyway. Traffic and Income That Lasts a Lifetime? And if you're worried your job could end (like many of my friends), why not use nights and weekends to start finding a solution now. Even if everything's fine but you hate your job, or if you really want to stay home and watch your kids grow up, this can help you too. I just thought you all should know this is out there. Also, I forgot to mention, there is a money-back guarantee. information on the money-back guarantee. Click here to talk to a live human. You Can Do This - If You Can Check Email, You Can Do SBI! Click here to get a free e book that will teach you how you can use your very own passion or knowledge to earn an income. Mull it over. Ask questions and check it out. Good luck to you all, whatever you decide and thank you for being such great visitors to my site!